call easy_install pyRadKDE in any shell. Test it by calling pyrad.py. This should automatically pull in pyKDE4. If it doesn’t, you need to install that seperately. 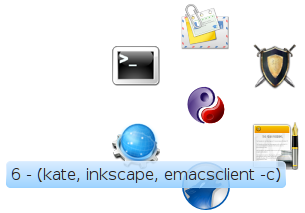 Visual icon selection requires the kdialog program (a standard part of KDE). For a "live" version, just clone the pyrad Mercurial repo and let KDE run "path/to/repo/pyrad.py" at startup. You can stop a running pyrad via pyrad.py --quit. pyrad.py --help gives usage instructions. I have no clue since I don’t use them. You’ll need to find out yourself or install a free system. Examples are Kubuntu for beginners and Gentoo for convenient tinkering. Both run GNU/Linux. Run /usr/bin/pyrad.py. Then add it as script to your autostart (systemsettings→advanced→autostart). You can now use Alt-F6 and Meta-F6 to call it. Add the mouse gesture in systemsettings (systemsettings→shortcuts) to call D-Bus: Program: org.kde.pyRad ; Object: /MainApplication ; Function: newInstance (you might have to enable gestures in the settings, too - in the shortcuts-window you should find a settings button). Alternately set the gesture to call the command dbus-send --type=method_call --dest=org.kde.pyRad /MainApplication org.kde.KUniqueApplication.newInstance. Customize the menu by editing the file "$HOME/.pyradrc" or middle-clicking (add) and right-clicking (edit) items. To call pyRad and see the command wheel, you simply use the gesture or key you assigned. Then you can activate an action with a single left click. Actions can be grouped into folders. To open a folder, you also simply left-click it. Also you can click the keyboard key shown at the beginning of the tooltip to activate an action (hover the mouse over an icon to see the tooltip). To make the wheel disappear or leave a folder, click the center or hit the key 0. To just make it disappear, hit escape. For editing an action, just right click it, and you’ll see the edit dialog. Each item has an icon (either an icon name from KDE or the path to an icon) and an action. The action is simply the command you would call in the shell (only simple commands, though, no real shell scripting or glob). To add a new action, simply middle-click the action before it. The wheel goes clockwise, with the first item being at the bottom. To add a new first item, middle-click the center. To add a new folder (or turn an item into a folder), simply click on the folder button, say OK and then click it to add actions in there. PPS: KDE, K Desktop Environment and the KDE Logo are trademarks of KDE e.V.